As part of your entire home improvement package Straight Line Roofing & Siding offers professional window and door replacement throughout central and southern Maine, including, Androscoggin, Cumberland and Sagadahoc Counties, Edgecomb, Wiscasset and Boothbay Harbor, Augusta and eastern Oxford County. 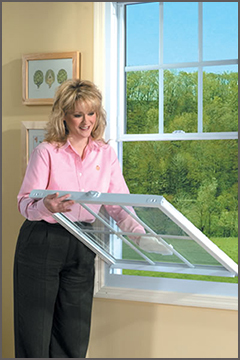 We are an authorized dealer for Paradigm windows and proudly offer an extensive collection of quality products for your window replacement project. Besides the expensive utility bills, it's pretty easy to recognize the signs of faulty doors and windows: poor seals, broken panes, drafts, visible condensation and foggy glass are just some of the warning signs. Why not be proactive by calling our team of window and door experts for a home inspection? We'll diagnose the problem and make our recommendations, assuring that your home is running as efficiently as possible, and your hard earned dollars aren't being tossed out the window - literally. Reduce monthly utility bills, increase the energy efficiency of your home, and at the same time, increase its value and curb appeal with new windows and doors. Contact the professionals at Straight Line Roofing & Siding and we'll help you find the most cost effective way to make this happen. Call us at 207-786-4414 or fill out our convenient online contact form for assistance.